1. Connect it to the internet, get visual feedback from it, and control it through your computer or phone. 2. Attach a Wii nunchuck to it. 3. Or make it remote controlled. 4. 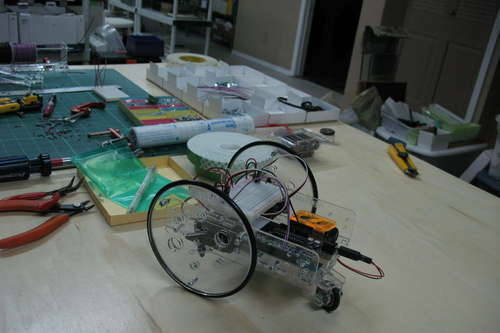 Make your robot detect obstacles and change its trajectory based on them by adding wire “whiskers” or an IR/distance sensor to your robot. Learn how to get started at the Intro to Arduino workshop, Tuesday September 27th, 7-9 PM (repeated every month).